A lot of people take Super Smash Bros. seriously, but none more than game director Masahiro Sakurai. Choosing who stays and who goes on the game's roster is "almost deadly in the amount of time it takes me," Sakurai tells Polygon. Three new characters (the Villager, Mega Man and Wii Fit Trainer) have already been announced for the new game, but Sakurai wants to "trim the fat" from the old Brawl roster, meaning for every new character added you can probably expect an old one to be cut. Sakurai says cutting old characters is much more difficult and stressful than adding new ones, telling us that "taking a character out [of the game] is what really hurts a lot." 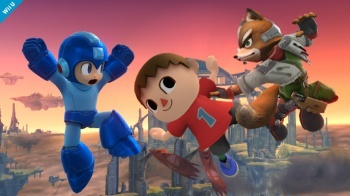 "Whether it's a minor character or a character that is one of the most highly skilled and most played, if that character is removed from the game, the people who live for that character in Smash Bros. are going to have their feelings hurt." "The amount of stress I feel, it's almost to the brink of death," said Sakurai, "Because it's not just a matter of me personally thinking this character or that character is going to be in the game; it's that we also have the game balance, animation, graphics and sound to think about in order to make that character fully fleshed out in that universe. I have to think about all of that when I go through this decision-making process." Sakurai says the in the process of deciding the fate of a character, the developers ask themselves "What is the uniqueness of this character? What does this character bring into the Smash Bros. universe? What do they have that other characters don't? How do they complement or contrast other characters?" He says that Mega Man's inclusion was assured because of his unique move set surrounding the Variable Weapons System. As for recurring characters, Sakurai promises that they will be re-built from scratch from the ground up. Characters should feel familiar to veterans of the series, but will be refined to help emphasis the character's "uniqueness." Super Smash Bros. for Wii U and 3DS comes out for the aforementioned systems in 2014.